This entry was posted on Wednesday, May 2nd, 2007 at 11:16 am	and is filed under News. You can follow any responses to this entry through the RSS 2.0 feed. You can leave a response, or trackback from your own site. it was a pleasant time in Hamburg partly due to that my accommodation was so cosy, friendly and conveniet. Now I would like to invite one of you for a night or two in my home. I´m living with my family(wife+3 boys) 65 km from Helsinki in “semirural” surroundings. We got a well behaving baby a mont ago, he is mostly eating and sleeping. You vill be provided own room. Unfortunately I´m leaving to Stockholm on friday morning, but on wednesday and thursday it would be fine for us. I have a car so there is no problem with transportation forth and back to Helsinki. 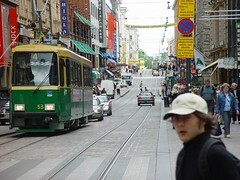 There is not much to “see” compared to Helsinki in my place. But I can quarantee a joyfull, relaxing and very very finish stay. Now I would like to invite one of you for a night or two in my home. I´m living with my family(wife+3 boys) 65 km from Helsinki in “semirural” surroundings. We got a well behaving baby a mont ago, but he is mostly eating and sleeping and you vill be provided an own room in our house. But I can quarantee a joyfull, relaxing and very very finnish stay. Sadly I do not think I will be able to offer anyone a place. We have a smallish apartment with 3 rooms, 2 girls and us. However I will check whether Arcada has any student apartments available at this time. If they have then that will be cheaper (lots) and nearer (lots) than any of the hotels. It is in my diary and I will ask on Monday. And let you know next Tuesday.